I often tell my students that reading is like swimming, the only way to get better at it is to do it. Which is only partially true. If you really want to get better at swimming, and at reading, you need to push yourself to perform at a higher rate than you typically do. Sometimes, you need a coach. Sometimes you need to challenge yourself. Dorothy Ko’s study of the rise and fall of footbinding in China was a challenge. I jokingly told C.J. that it was above my reading level by three or four months. (Remember those tests back in the day that told you your reading level in years and months? Good times.) I admit, or boast, whatever, that I read at a fairly high level. Not as high as I did back in graduate school, I’ve fallen out of reading shape since then, but still fairly high. So, it was kind of nice to have a book that challenged me a little, not too much, but just enough to make those reading muscles feel the burn. I enjoyed the book as well. Learned quite a bit, too. Cinderella’s Sisters is divided into two parts, how footbinding fell out of favor and how it came to be. What’s interesting is that Ms. Ko starts with the ending then goes back to the beginning. Though she does look briefly at archeological evidence, Ms. Ko is primarily interested in the written record, which is a problem for her because there isn’t much. You’d think that something with a 1000-year-old history would leave an extensive written record. But footbinding has always been a sensitive subject, something so closely tied to eroticism that writing about it has never been fully respectable. Most of the writing about footbinding has been done by those opposed to it which reflects a strong bias. Most of this writing was done by men which shuts out the viewpoint of the women who practiced footbinding. Many of the men who wrote about it were European missionaries which shut out the Chinese point of view altogether. Footbinding had to be eliminated, in their view, if China was to ever become a part of the modern world. 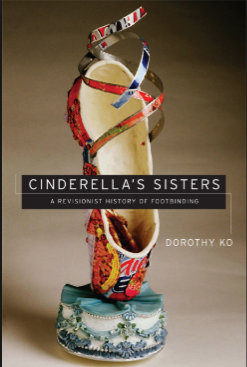 You may agree with this, Ms. Ko may as well, she never says, but her goal in Cinderella’s Sisters was to present an unbiased, non-judgemental history of footbinding as far as such a thing is possible. You should avoid speaking in large generalities. Footbinding was never a single universal practice in China. There were substantial differences based on region, based on class, based on periods in time. Sometimes the goal was a narrow flat foot, sometimes it was the tiny arched foot, the golden lotus, that most westerners think of when they think of footbinding. Footbinding was not always something done by upper-class, urban women. Women in the countryside participated; footbinding lasted in the remote northwest of China until this century. Sometimes it was a way to move up socially into a higher class. Sometimes it was a marker of class membership. It changed over time. While male desire was always a part of footbinding, it was not the only motivation. The tradition carried on in parts of China even as it became something more and more people saw as shameful. The main crusades against footbinding were organized and led by men, many of them westerners. Cinderella’s Sisters shows just how difficult it can be to know history when Ms. Ko begins to look for the origins of footbinding. She finds writing about how desirable small feet are long before clear evidence of footbinding appears in the written record. Hints dropped in poetry, a line or two in a novel or a play. Did the idea of footbinding predate it? Legend gets so mixed up with history that it becomes difficult to separate. Were there really bandit women in western China with bound feet, raiding on horseback, terrorizing and titillating the countryside? Was there really once a city-wide celebration of footbinding when women sat outside their houses with their feet on stools so that passersby could judge who had the smallest feet? Western critics of footbinding recorded how horrified they were to hear the screams of the girls as their feet were bound for the first time, but did not record how groups of women prepared the materials they needed on a daily basis to take care of their feet. Until fairly late in the modern era all of the materials, shoes included, were made by the women themselves. Does this all make me sound like I don’t really know what to think about Cinderella’s Sisters? Instead of offering blanket statements or a comprehensive history in this book, I have presented my readings of what I take to be the most intriguing texts and objects produced during footbinding’s long history. In structuring the chapters so that they introduce a succession of local, partial, and often conflicting viewpoints, I hope to create an open-ended space in which each reader will not only come to his or her own conclusions but also continue o reassess them. I think “reassess” is key to Ms. Ko’s view of history. HIstory is not something we should view as written in stone, nor even as written on paper, really. It’s something we should assemble as we go, each new piece of evidence to be added to an ever-changing picture of the whole. Something one can seek to better understand, not something one can ever be fully understood.